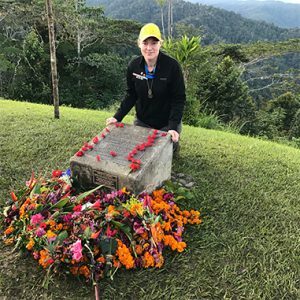 A life-shattering event led me to the Kokoda Track… and drove me all the way to the finish line. My youngest brother Ben, an ADF member, died by suicide in September 2016. I was completely and utterly devastated. 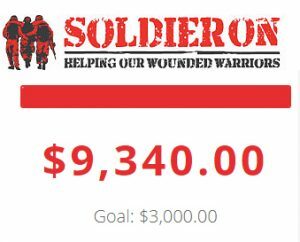 I wanted to find a way to try and make it count for something; to let others know there were alternatives, there was help, and for our ADF brothers and sisters that there was support. I thought, we won’t ever do it together now, but I can do it, for you, for others. I want to be on the track next ANZAC Day. I can make a difference. I wanted to also support a charity who supported our service people. A week went past from me thinking about doing it, to booking and paying my deposit with Back Track Adventures, and registering a fundraising page with Soldier On. It was real, I was all in. I had heard great things about Back Track and being based right here in Brisbane I thought it was a perfect choice. Little did I realise, the Sunday morning training that was ‘informally’ organised was amazing. I had no recent hiking experience; I really had no clue how I was going to put my plan into action. The first steamy morning in January I turned up at Mt. Coot-tha before 6am and was greeted and welcomed by the group who had turned up to walk. Over the next couple of months I met others from my trek and I really believed I was going to do this. My confidence had grown. 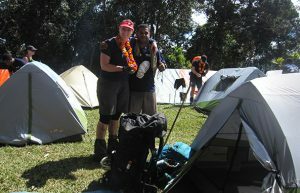 As the time got closer to the trek and I had raised more money for Soldier On, I started to freak out a bit. 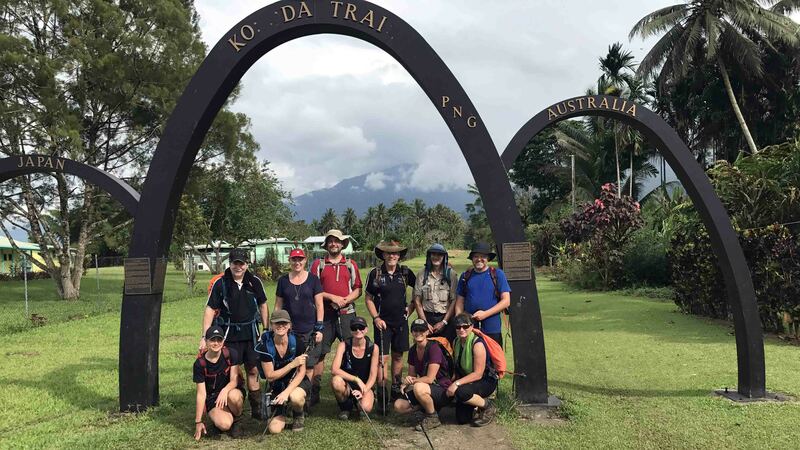 Within the three weeks prior to leaving for Port Moresby I had a lot of self-doubt. Would I really be able to do the trek? If I couldn’t I’d be letting myself, my brother, and everyone who had donated to my fundraising effort down. I really did psych myself out. But the time had come. I’m sure I ‘nervous talked’ all the way to Port Moresby, but everyone else was a little nervous so I felt comfort that it wasn’t just me. Me with my wonderful porter, Fred – “there to help every single step of the way”. Team 6, 2017 left from Ower’s Corner on 20 April. It had been raining, but everyone was in good spirits and we were ready to start. The first day was only a couple of hours downhill in the mud (so much mud) to Goldie River. In the dark. My porter, Fred, wasn’t aware of what he was in for yet. Day 2 was the longest day. Across Goldie River – a nice fresh wake-up call for the morning, and up Imita Ridge which I thought was going to be the most difficult part. I was soon to learn that going down Imita Ridge and any other downhill would be my nemesis. You had to watch every single step you took at all times. The mud, the tree roots, the steep steps down, all knocked my confidence and every step was a mental battle to fight ‘what if I fall over and I can’t go on’. The Fuzzy Wuzzy angels were there to help every single step of the way. I actually enjoyed the uphill parts, even when we faced ‘The Wall’ (pictured left); I just kept putting one foot in front of the other. 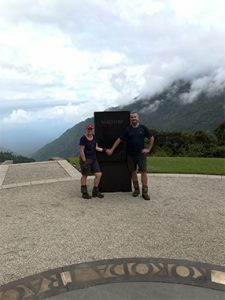 At this time in my head my left foot was Ben, my right foot was Kaz as I maintained that we were doing this together, but he could never be ‘right’. Each little break, each meal, each night our team got to know each other better. The bond that you create while you are pushing yourself to the limit—both physically and mentally—is incredible. We all had our moments and we all had a reason to be there. 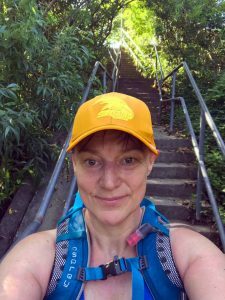 I had such a range of emotions: there were frustrated tears from the slow downhills and frequent stacks in the mud. I managed to snap both my walking poles at different times. I had sad tears not only on ANZAC day but other moments. Then there were the laughs. Who knew an orange rolling down a hill could be so funny? I will never forget the dawn service at Brigade Hill. I was so honoured to lay a wreath on behalf of Team 6 and I thank them for allowing me to do that. From the porters who are always just there, the villagers from whom you can buy the most delicious fruit, cans of drinks, Twisties (great for playing 2-up on ANZAC day), bilums along the way, and the jungle itself with the big blue butterflies – you just need to remember to take time to stop, take a look around and take photos! 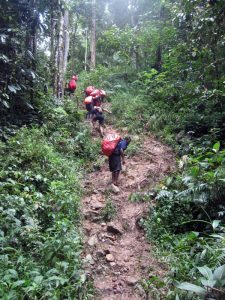 Kokoda is both beautiful and brutal all at once and it was the most incredible experience. RIP brother – thank you for your service. We did it. 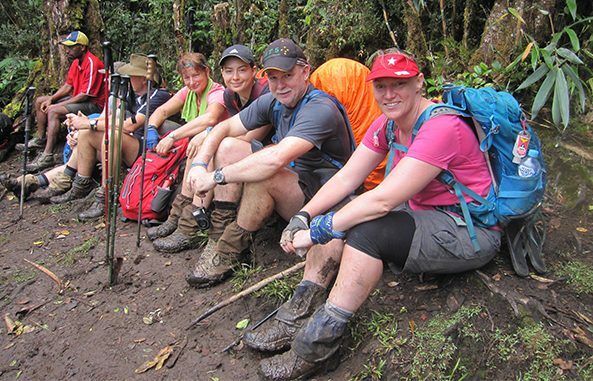 The team at Back Track Adventures offer their sincere condolences to Karen on the loss of her brother, Ben. We were proud to host you on your journey, Karen, and we take our hat off to you for your personal and fundraising achievements.